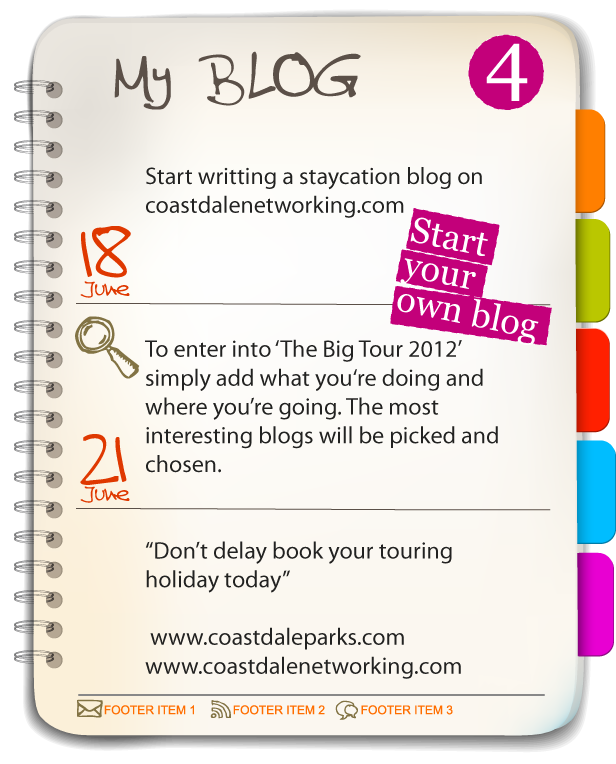 Each participant must show evidence by means of taking a picture on their, phone or camera or starting a Blog or video diary on coastdaleparks.com. Create your profile with coastdalenetworking.com, and Upload a video of your trips. If you're not internet savvy you could simply send us a post card with pictures of places you visited whilst visiting our parks in 2012. 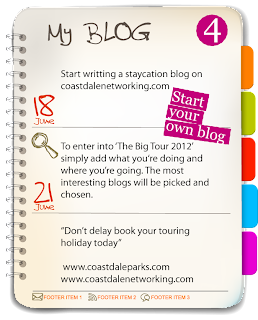 Create your profile with coastdalenetworking.com, and write a ‘Staycation Blog’, by adding information, uploading pictures and writing about the areas you visit. Hailed as the ultimate year-round holiday destination, having been declared Best UK Seaside Town two years running at the 2010 and 2011 British Travel Awards and Best Family Holiday Destination in the prestigious Coast Awards 2010. St Ives was praised for its mix of adult and child friendly attractions and things to do, and was singled out for having a unique art scene. Inspire your creative side with a visit to the Barbara Hepworth Sculpture Garden and the Tate St Ives, with its regularly changing exhibitions of international modern and contemporary art and tranquil roof top cafe. Michael Foreman, writer and illustrator, lives between his two houses in St Ives and London. His favourite place to relax is St Ives and he has a studio in the garden of his house where he works and watches the sea. Chill out after exploring the array of shops and galleries with a drink or splash out on the culinary delights at one of the top restaurants around the harbour. The restaurants in St Ives have a deserved reputation for the quality and variety of fish that they serve. September is the time to visit St Ives if you enjoy live music, theatre, dance, art, talks, poetry, and comedy. This is all crammed into the15-day action-packed St Ives September Festival. Take a stroll down to the picturesque harbour, where working fishing boats have been landing their catches for hundreds of years. Boat trips are available (weather permitting) to Seal Island or choose to sail around Godrevy Lighthouse and Hell's Mouth. Fishing trips can be arranged locally giving you the chance to fish for fresh mackerel and pollock. Ride the waves at Blue Flag award winning Porthmeor Beach. A popular surfing and body boarding beach. Porthmeor, along with Porthminster and Carbis Bay all offer beautiful soft golden sand - ideal for families and for making great sandcastles! Hayle has a wonderful 3 mile sandy beach that stretches from the Hayle estuary to Gwithian Towans and Godrevy Point. The lower half of this stretch of beach is close to the town and comprises different sections of beach known as Hayle Towans, Black Cliff and Mexico Towans. Hayle's popular town and sheltered estuary attracts many migratory birds making it nationally popular with bird-watchers. Paradise Park is an award winning sanctuary in Hayle specialising in rare birds - especially parrots. Further attractions close by include Godolphin House and King Edward Mine. Just 3 miles from St Ives is Zennor, a village steeped in myth and legend. The village is situated in a remote area of West Cornwall and has been inhabited since prehistoric times. D H Lawrence wrote 'Women in Love' in Zennor and he described the village as being 'the best place he had ever been in'. Down a narrow lane, backing on to the harbor, lays Walker’s House, which belonged to Captain John Walker. The Whitby Museum Whitby Museum is an independent Museum staffed by volunteers and operated by Whitby Literary & Philosophical Society. There is no better way to see the coast of Whitby then by boat. 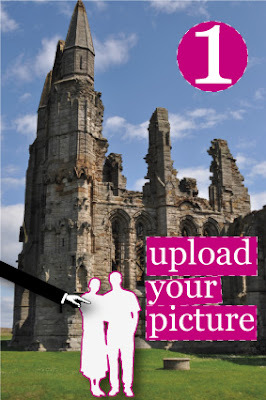 Whitby Abbey, an iconic gothic ruin, rests on the East Cliff above the famous seaside town. Even away from the hectic town centre there are several activities, which you can enjoy. One of the most loved passtimes in Whitby is Crabbing in Whitby harbor. Sea Urchin charters offer boat trips based at Whitby licenced for 12 passengers. For those of you that are interested in a bit of history, Eden Camp is a great family day out. While you are on holiday in Whitby why not try your hand at a spot of fishing? Suffolk offers a great range of activities and attractions to suit everyone’s taste and pocket. We offer all sorts of things to do in Suffolk from discovering historic churches and timber framed Guildhalls, to tours of one of only 8 Grade 1 listed theatres in the UK, right through to musical events, shops and eating out venues to suit everyone's tastes. Why not learn a new skill (or improve upon an existing one) whilst on your day out in Suffolk? You can do just that at The Cooking Experience, Hadleigh. On offer are a variety of expert cookery courses aimed at all levels of experience. Each class is taught is a very friendly and relaxed manner, and no student will be put on the spot or embarrassed! Before you know it you'll be creating delicious breads, exciting main courses, impressive starters and tempting desserts! Residential weekend courses are also available. Where you can see how teapots are made and painted by hand, paint your very own teapot at the Teapot Pottery (you can return after a few days and collect your creation, or have it posted to you), relax in a friendly atmosphere and enjoy a refreshing cup of tea in the new conservatory which also sells home-made cakes and scones. This is a great day out for children and families, and the collection of teapots on display (and available for purchase) will amaze you! If you have a passion for antiques and discovering hidden treasures, one of the on-going auctions from Mander Auctioneers, Clare will make for a great day (or 2!) out. At a Manders auction you will find an array of furniture, silver, pictures, ceramics, jewelry and more. Auctions are held on Saturdays, with the Friday before being a viewing day - so you can decide which item you want to snap up in advance! For more information and a list of auction dates, please click on the link above. Discover Suffolk by taking a Treasure Trail! Have a fun family day out walking, exploring various parts of Suffolk and learning of its history - then solve the clues and win a cash prize! Courses are a great way to spend a day out in Suffolk. If you have always fancied trying your hand at baking, Sugarplum Cupcakes in Woodbridge, offer fantastic Cupcake Workshops where you can learn how to bake and decorate your own cupcakes. This is a great day out for all the family, and you get to take twelve of your delicious, beautifully decorated cupcakes away with you! The workshops run on a regular basis - please click on the link above for full details. Sites don’t get much more Historic than Sutton Hoo, the burial ground of Anglo Saxon Kings. There are plenty of Things to do in Suffolk at Sutton Hoo, which is run by the National Trust and includes an exhibition hall with video and a full size reconstruction of the ship’s burial chamber. There are Guided Tours and special events during the summer season. Staying with the Anglo Saxons, West Stow Anglo-Saxon Village is a unique reconstruction of an Anglo Saxon Village built on an original archaeological site. Costumes bring the Village to life during the holidays, and a visitor centre displays finds from the site. Suffolk has a few well, preserved and impressive CASTLES including Framlingham Castle (above), and Orford Castle, below, which are both run by English Heritage. Orford was the great keep of Henry II. 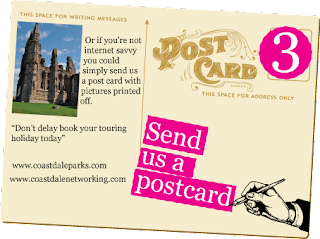 You can visit the castle today and explore the maze of rooms and passageways with a free audio tour. You can also enjoy spectacular views over the beautiful Orford Ness in this lovely area of Suffolk. If you're coming to Suffolk from Essex then a visit to Castle Hedingham to visit to Colne Valley Steam Railway is a must - it is always rated one of the top Visitor Attractions in Essex. Colne Valley is a really pretty line, currently one mile long, with relocated station buildings, signal boxes and bridges all lovingly restored and rebuilt. There's a lot to see including the Garden Railway, Travelling Post Office Exhibition... Thomas the Tank Days and during the Summer you can ramble through the Farm Park and enjoy the 30 acres of peaceful, natural countryside by the River Colne. Apart from the wealth of traditional farm animals, some regular sightings have included: Moorhens, Woodpeckers, Kingfishers, Herons and Dragonflies. If you like Steam Railways but you're visiting the northern part of Suffolk, check out Bressingham Steam Railway - whether you choose to explore one of Europe's leading steam collections, take a ride on Bressingham's famous Victorian 'Gallopers', journey over five miles of narrow-gauge steam railway, wander through beautiful gardens, or visit the only official "Dad's Army" exhibition in existence, you'll find something for everyone when you arrive at Bressingham. Southwold is home to the wonderful Amber Shop and Museum. The Museum follows the fascinating story of amber, and features a number of beautiful amber carvings and artefacts from around the world. After becoming familiar with the history of this beautiful gem, visitors may choose from an extensive range of jewellery and carvings in the Amber Shop to take away with them. Suffolk retains many fine examples of Medieval, Tudor, Georgian and Victorian architecture, sometimes within walking distance. For example, Kentwell Hall in Long Melford is a stunning example of a Tudor House, situated close to Melford Hall, another Tudor Manor house but in a very different style. Holy Trinity Church nearby is Medieval, and there are several lovely private residences in Long Melford dating from the Georgian and Victorian times. Euston Hall is the home of the Duke and Duchess of Grafton but it is open to the public to view their unique collection of paintings of the Court of Charles 11, including works by Van Dyck and Lely. For a fascinating history of local lad Gainsborough’s life, Gainsborough's House in Sudbury is the place to be. This is probably the only museum dedicated to an artist who actually once resided in the same house. Located on the north-western side of Wales, Gwynedd is a perfect place to visit. It is mostly located within Snowdonia National Park, and the Snowdonia mountain ranges and Cambrian Coastline. It offers visitors a wide range of attractions from activity programmes to inspirational cultural and historical places to visit. A harbour town situated on the Glaslyn Estuary, Porthmadog is rich in maritime history and is an excellent base for touring the surrounding area. It has a number craft shops and restaurants. The town was named after W.A. Maddocks whose ambitious "Cob" embankment scheme led to the town's name, which translates as "Madog's Port". In times gone by, it was a vital, busy shipping port for the international slate trade, brought down from Blaenau Ffestiniog. The maritime history depicts its proud past. A 21km trek through meadows, woodlands, lakes and waterfalls within Snowdonia National Park. It was in 1832 that an Act of Parliament allowed the construction of the railway from Porthmadog to near Ffestiniog and opened to freight traffic on April 20th 1836. Powered by horses initially, the first steam locomotives were put in use of October 23rd 1863 at a cost of £1000 for each of the two engines. Passenger services started in 1865 and carried over 100,000 passengers per year were for the first three years along with 100,000 tons of slate. In the 1880's the slate industry was in decline, exasperated by the building of the slate wharf at Delaney by the London North Western Rail Company. By 1900 the company already relied on tourists to make up the income. The unique and famous Italianate village built by the architect Sir Clough Williams-Ellis. The village is reduced in scale, like a diorama, giving the impression of large size in a moderate space. It became famous as the set for the television series The Prisoner, starring Patrick McGoohan, who was Number 6. Portmeirion is halfway between Porthmadog and Penrhyndeudraeth and located on a rugged cliff top on its own private peninsula overlooking Cardigan Bay and is surrounded by subtropical woodlands and miles of sandy beaches. The walks are well worth the visit. Located on the outskirts of Porthmadog, the beach at Blackrock Sands stretches for miles and is a haven for beach games and resting. T. E Lawrence, of Lawrence of Arabia fame lived nearby and the 14th century poet Shelley is reputed to have regularly visited. This coastal resort offers superb views of Tremadog Bay, sandy beaches, fine restaurants and good accommodation. Criccieth Castle, built by Llewelyn the Great in the l3th Century dominates the skyline and hosts an exhibition reliving Gerald of Wales' journey through Wales. Today the town attracts watersports enthusiasts. It is home to the famous Cadwaladers ice cream first produced in the 1920's. Pwllheli "salt water pool" is an old market town at the entrance to the Llyn Peninsula, which received the Borough Charter over 600 years ago by the Black Prince. It is an ideal base for touring the Llyn Peninsula and the town's Marian y De beach has obtained a European Blue Flag Award. The town is full of character with its narrow streets, shops and cafes. Every Wednesday the open-air market is held on Y Maes. Hafan Pwllheli Marina. The marina is reputed as being one of Britain's finest marinas and sailing centres and a ‘European Centre of Excellence’ in Sailing, and the venue to a number of National and International sailing and water sports events. There is also a local leisure centre, which can be used when the weather is not so good. Pennarth Fawr is a medieval stone house with a superb wooden interior. The National Trust's Plas yn Rhiw a 17 / 19th Century Welsh manor house set in ornamental gardens, is well worth a visit as is Plas Glyn y Weddw art gallery, a Victorian gothic mansion which hosts exhibitions and has excellent landscaped gardens. History tells us that in early Christian times the Llyn Peninsula was a land of saints and pilgrims, hill forts, holy wells and small churches of which the remains can often be seen. The area is soaked in early Celtic religious history and up to, 20,000 Saints are allegedly buried on Ynys Enlli or Bardsey meaning the "Island of Strong Currents". Pwllheli harbour has a long history - wines from the Continent were imported through here and the coast was a haven for smugglers and pirates. As recently as the last century it was one of the main fishing and ship building centres in North Wales with nearly 30 ships in production at the same time. The arrival of railways in Pwllheli allowed it to develop further as a centre of social and political life, business and tourism. Llanystumdwy is the home of "Highgate", the childhood home of David Lloyd George, the famous Liberal Statesman who later became Prime Minister. A Victorian schoolroom museum is dedicated to his life and his grave can be found by, the River Dwyfor. The memorial gates by his grave were a gift from Pwllheli in 1952 and carry the elephant and castle, which figure in the town's coat of arms. This mountain village is situated beside the River's Glaslyn and Colwyn in the heart of the Snowdonia National Park in the midst of Snowdonia's magnificent walking country. The name Beddgelert, meaning Gelert's grave, is famed for the legend of Gelert the dog that was left by Prince Llywelyn to guard his child. The poor dog covered in blood was killed by his master before he realised that the heroic hound had in fact saved the child from the wolf. Visit the site of Gelert's grave and Llywelyn's cottage. Beddgelert over the years has won a number of National accolades for its admirable environmental programme to enhance the village - Wales in Bloom. Britain in Bloom and in 1997 won the Gold Award for villages in the ENTENTE FLORALE, the prestigious Europe in Bloom competition. You can experience the copper mining industry by visiting Sygun Copper Mine, an 18th/19th century mining workings with its winding tunnels containing Stalactites and Stalagmites and colourful caverns. Take an underground tour and learn the geology of Snowdonia and how copper ore was extracted. Wales abounds with magnificent castles. Conwy, Caernarfon and Harlech are all World Heritage Sites and definitely worth a visit. The sheer power and presence of Wales' most famous castle, Caernarfon Castle, is still awesome in today’s world. When first built in the 13th century, it must have presented an invincible image to the people it dominated. In 1969, HRH Prince Charles, became Prince of Wales at his investiture in Caernarfon Castle. At Conwy, the mighty 13th Century castle dominates the estuary and you can walk the ancient town walls, which gives a flavour of the might of this ancient monument. Wales provides stiff competition for other venues in terms of the number and range of activities taking place within such a localised area. For an adventure and activity holiday with wide-open spaces and breathtaking scenery then Snowdonia, Llyn Peninsula and the Cambrian Coast are worth considering. The activities include walking, cycling, climbing, pony trekking, surfing, water skiing, canoeing, quad biking, clay pigeon shooting, or abseiling. There are six designated routes to the summit of Snowdon and a variety of walking routes to Cader Idris, Snowdonia is the ideal place for both serious climbers and keen walkers. Llanberis is an excellent base from which to explore Snowdonia and there is a network of attractive walks suitable for all the family. For stunning walks through scenic gorges and by rushing rivers, start off at Betws-y-Coed. Welsh is the first language of over a million people, and in the area of Snowdonia, the Llyn Peninsula and the Cambrian Coast around 70% of the population are Welsh speakers. Welsh is one of the oldest living languages in Europe and shares its roots with Breton, Gaelic and Cornish. The sense of community is very strong and Snowdonia's appeal springs from its unique heritage, culture and language, which touches on everyday life, giving this area a truly distinctive character.